Following their award-winning run at The Brighton Fringe last year, Leigh and Joanna – otherwise known as Mac & Eden – are back again this year with their show The Unbearable Pleasure of Being a Woman, this time at The Verdict, Edward Street from May 29-31 and on June 3. Joanna Eden is the singer-songwriter; Leigh McDonald the West End and National Theatre actress. 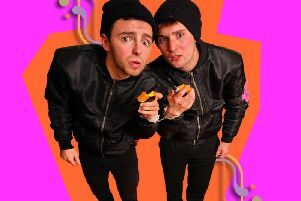 Together they promise candid, poignant and irreverent original songs in a side-splitting comedy/cabaret. As they say, being female can be an unbearably-silly business. They manage to spend a whole evening laughing, crying and even singing about it on an “oestrogen-driven, emotional rollercoaster ride”. From pigtails to puberty, stilettos to strollers, marriage to messing it up, it will be fabulous and filthy, Joanna says.